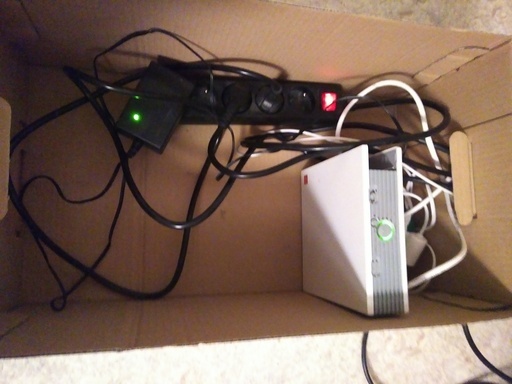 In a attempt to find a solution to the multiple cables running wild in my room, I thought of hiding them into a box, but I am concerned about a possible fire hazard. Sometimes or at night: wifi router and phone charger. The dimensions of the box (as shown on the picture above) are 50×30×20 cm. If that is of any relevance, I live in France. Is there a chance this could catch fire if I stick to these use cases? Can I also safely close the lid, which is cardboard too? Its not particularly risky, but its not a fantastic idea either. The amounts of current you are talking about pulling is not great, so heat dissipation should nor be an issue. No one will give you a guarantee that it wont catch fire, but it us highly unlikely provided none of the cables have exposed wiring (which might short and spark). If you're worried about the fire hazard you can line it with some cheap material like ceramic tile or clay. Ignition temperature of cardboard 260 C.
Ignition temperature of wood 365 C.
Ignition temperature of clay/ceramics 1000+ C.
Not the answer you're looking for? Browse other questions tagged electrical wiring safety fire-hazard or ask your own question. Is turning off a power strip adequate? How to strip sheath off outdoor cable? Is modifying a box unsafe or against any electrical codes? How to identify potentially unsafe electrical connectors in use? What is a “seized” power strip?